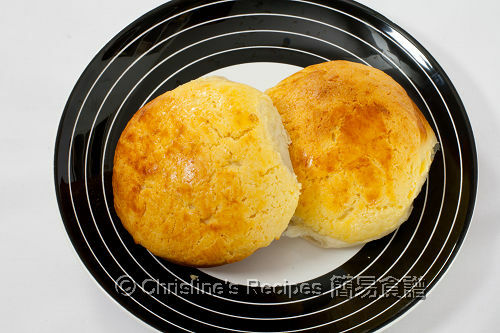 Pineapple buns (aka Bo Luo Bao 菠蘿包) is a classic soft, sweet buns in Hong Kong where I grew up with eating countless pineapple buns as afternoon tea. The recipe I developed here, was adapted from the owner of a Hong Kong bakery shop, specialized in making and selling pineapple buns. There are two important ingredients in the original recipe, lard for making the topping crispy, and ammonia powder for making the crackling patterns on the crispy topping. As I don’t use lard in my home-cooking at all, I tweaked it and used butter only. Besides, how would I make Asian breads without tangzhong (湯種)? Absolutely not. Many of my readers have already known that I’m addicted to tangzhong breads because they are soft and fluffy, and can be kept for days. Since I tweaked the original recipe with butter and tangzhong, I have had three trials until I got it right and feel satisfied. As for using ammonia powder, it’s quite tricky. If used not enough, you’d be disappointed for no crackling patterns appear on the topping. If more than enough, your buns would smell weird (yes, like wee). Hope that I didn’t scare you off. If you don’t want to risk, or can’t find any ammonia powder, you can skip the ingredient, and use a knife to score the top pastry before transferring your buns in oven for baking. You’d get regular patterns, instead of getting irregular crackling that classic Hong Kong pineapple buns would have. Taste remains the same anyway. Hope you all like my sharing here. Combine all dry ingredients: flour, salt, sugar and yeast in a bowl. Make a well in the center. Whisk and combine all wet ingredients: milk, egg and tangzhong, then add into the well of the dry ingredients. When all ingredients get together, knead in the softened butter. The dough is quite sticky and messy at this stage. Keep kneading until the dough is smooth, not sticky and elastic. 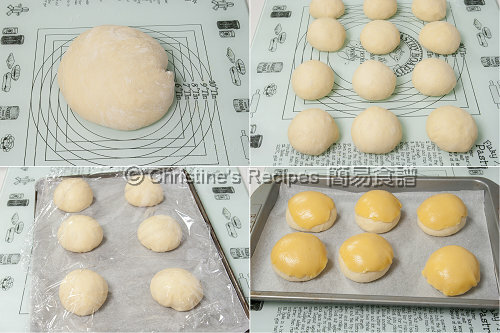 Shape dough into a ball. Place in a greased bowl and cover with a wet towel or cling wrap. Let it proof till it's doubled in size, about 40 minutes. Transfer the dough to a clean floured surface. Deflate and divide into 12 equal portions. Cover with cling wrap, let rest for 15 minutes. Meanwhile, make the topping, refer to the directions below. Knead each little dough portions into ball shapes. Let them complete the 2nd round of proofing, about 35 minutes, doubled in size. Preheat oven to 210°C (410°F). When the dough portions are doubled in size, remove topping paste from fridge, cut into 12 equal portions and roll in balls. Cover by a film wrap and press each portion into a flat disc. Place on top of the small dough. Repeat this step with the rest. Brush the top with whisked egg yolk and bake in a preheated 210°C (410°F) for 5 minutes. Reduce the temperature to 180°C (356°F) and bake for another 15 minutes. Cream softened butter with an electric mixer over medium speed until smooth. Add sugar and continue to beat until fluffy. Add milk powder, egg yolk, evaporated milk, condensed milk, baking powder, combine well. Sift in flour and ammonia powder and incorporate well. The mixture is quite moist and sticky. Use a piece of film wrap to roll into a log. Chill for 30 to 40 minutes. When it becomes harder, it’s ready to use and shape it. As for the amount of ammonia powder, don’t go over 1/4 teaspoon of it when using 125 grams of cake flour to make the topping. If you use less or more flour, please adjust the amount of ammonia powder accordingly. I love Polo bread. It's one of my favourite asian bread. Thanks for sharing the recipe. Wish you a happy chinese new year. I love Polo Bao especially when I'm in Hong Kong, would never miss to buy one. I love the look of this bun, so delicious looking, a bit similar to the mexican buns I think...great blog! Heading over now. Can you send some buns over first? I have read with much interest your post at Pig Pig's Corner. And I want you to know this is one of the most detailed and informative recipe I have ever read on Bo Luo Bao, great job Christine! I love Polo bun, yummy! Wish you and your family a Happy Lunar New Year, Gong Xi Fa Cai! Oh My goodness! I love pineapple bun! You just made my day! If I can make this at home, I won't have to drive so far just to get it. This is my absolute favorite bun to eat! Thank you so much for sharing this recipe. I am delighted to have found your site and could hardly wait to try making this. I have a question though. 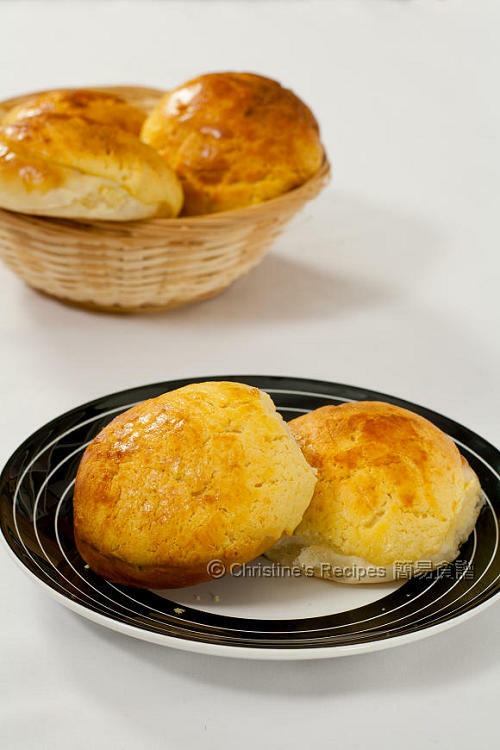 I tried making these Pineapple buns, as well as your Coconut Custard buns with the Tangzhong. However, I found that the dough for both were far too wet to handle (I don't have a bread machine) to reach a dough, so I had to add about 80 more grams of flour and kneaded. If using the Tangzhong, should I omit or reduce the amount of milk or some of the other wet ingredients? I'm not sure what I'm doing wrong. The tangzhong dough is very wet and sticky, so that's why I always use my breadmaker to do the kneading part. It's very challenging to handle by hand. You might sprinkle a bit of flour to prevent the surface sticking to your hands while working. Adding too much flour will destroy the balance of all ingredients and hurt the texture. The 80 more grams of flour was too much. Thanks Christine for the tip. I made some 菠蘿包 using your recipe. I didn't have ammonia powder or evaporated milk. I just used condensed milk to replace the evaporated milk in the recipe. I am very pleased with the results. They are not exactly the same as the shop bought ones but my mum said she actually preferred the ones I made. The crust was crunchy but it didn't break as easily as the shop bought ones so the buns were less messy when we bit into them. Thanks for sharing with your readers the tangzhong method. So glad to know that you and your mum loved my recipe. You won't need to buy your mum any 菠蘿包 from now on, instead she can enjoy your homemade ones, hot from the oven whenever she craves for some. So good. Hi Christine! I tried out your recipe, and it was great! I did some substitutions for the dairy products, but it turned out really good! Wonderful ! How nice you can have homemade dairy-free pineapple buns. Thanks for the shout-out. i love your website and recipes. they're awesome and i've tried a few of them myself. i followed your buo lo bao recipe and the buns come out tasting amazing. the only thing is the crust isn't as yellow as yours? do i need to use an extra egg yolk for the color? Good idea of using egg yolk to add more yellowish colour on the crust. I love your bread recipes and I've tried making your pineapple buns, but no matter how much I follow the recipe my buns never seem to rise with that nice semi circle shape - they end up looking quite 'flat' and spread out. What seems to be the problem?? Is it to do with the proofing? 1. The yeast was expired or didn't work for some reason. or 3. The dough was over kneaded. or 4. Something wrong with the proofing. Without enough information provided, I can't diagnose what problem you encountered exactly. Sorry. It's been my favorite, ever since I was little :D. We used to go to the Chinese bakery quite a lot and my mom would always get me some delicious buns. Thanks for sharing this recipe, Christine. A) Should I activate the yeast using warm water, milk and sugar first? I've never tried making bread where I Just throw in the active dry yeast in with the dry ingredients then just putting in the wet ingredients into the well. B) If I'm using a kitchen aid with a dough hook attachment, would this cause the issue because I'm not kneading the dough by hand? C) How long should I knead (by hand or machine) before it becomes "smooth"? I kneaded on machine for about 20 minutes, is that enough? It was still a bit sticky and elastic, but it seemed like the dough was well blended. D) Instead of 40 mins, I left the dough for about 1.5 hours for the initial proofing as it is only about 20 degrees celsius here where I live, however, the dough did not double in size. E) The topping kept melting before I was able to flatten it into a piece of dough to put on top of the pineapple buns, is it possible to just spread it on the top of the bun instead of putting a flat piece of dough? A) If using instant dried yeast, no need to activate it with warm water. It works well after mixing with other ingredients. Just make sure the yeast doesn't directly contact with the salt or sugar. But if you like to activate it beforehand, it's still no harm at all. B) The dough can be kneaded by a stand mixer or by hand. Some of my fans made these buns successfully with their kitchenaid. C) If kneading with a stand mixer, 20 minutes are quite enough. But don't judge by time, test your dough if it develops enough gluten inside. If the dough passes the window-pane test, it's done. D) If your dough couldn't be doubled in size after such a long time of proofing, I guess it's something wrong with the dough. E) Sure, you can adjust the method to suit your situation. Or you might like to put the topping back to fridge until it's workable again. Thanks for the great recipe on pig pig's corner - my family and I all really love all your tangzhong recipes! I wanted to ask you if its possible to make the topping a day in advance? I want to make the pineapple buns and serve them fresh out the oven for a party but won't have enough time to make the toppings in between. Thank you! 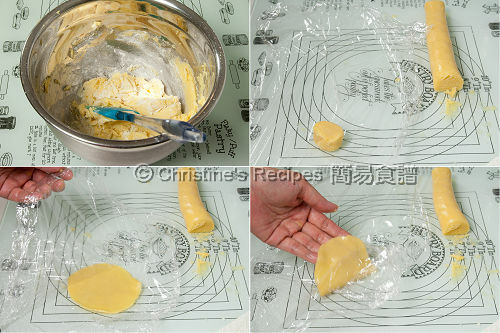 Sure the dough for topping can be made in advance and wrapped properly, then put in fridge. Sorry, forgot to ask...if I cannot prepare the topping a day in advance how much time in advance can I do it? Is a few hours ok? Thank you so much! Depends on how fast you go about it. It can be done within half an hour, not including proofing time. I can't find the recipe. I don't understand Chinese so the video did not help. Pl help! Click the link to Ann's blog on the post, then you'll get the recipe. Ann's blog is down, unable to access the recipe. Is there any other link to it? I've managed to put back my original recipe on my blog again. Thanks for your patience. Ann's blog is down or gone. Can the recipe be found anywhere else? I've updated this blog post and put back my original recipe here. Thanks for letting me know. The pineapple buns are a success. They were soft on the bottom and crunchy on top coming out of the oven. However, the bun (bottom) turned a bit dry and hard the next day. Can you think of any reason why? I thought tangzhong buns can stay soft for a few days. Highly probable that the oven temperature, especially the bottom heater, was a bit too high. The material of your baking tray will also has impact on your bread. Besides, once your bread is removed from your oven, the moist inside will escape. So next time, try decreasing your oven temperature a bit, or bake shorter time. The buns looks lovely and yummy. Can't wait to try your recipe. Thanks for sharing! One question - do you know what can be substitute for the 1. Evaporated milk 2. ammonia powder, please? Thanks! 1) You may use milk instead if you don't mind it's not creamy enough. 2) Replace with baking powder then. Hi,thanks for sharing the recipe. I tried and the bun was soft. Only thing I find the topping not sweet enough. I think I will add more sugar next time. You can add more sugar to suit your personal taste for sure.